Azzi, Stephen. "Constitution of Canada". The Canadian Encyclopedia, 16 July 2018, Historica Canada. https://www.thecanadianencyclopedia.ca/en/article/constitution. Accessed 21 April 2019. The Constitution of Canada is the country’s governing legal framework. It defines the powers of the executive branches of government and the legislatures at both the national and provincial levels. Canada’s Constitution is not one legal document but is composed of several statutes and orders, as well as generally accepted practices known as constitutional conventions. The Canadian flag, and the flags of the 10 provinces and three territories. The written Constitution is Canada’s supreme law and overrides any laws that are inconsistent with it. It includes the British North America Act, 1867; the Statute of Westminster, 1931 (to the extent that it applies to Canada); the Constitution Act, 1982; subsequent amendments to these acts; and the acts and orders that brought new provinces and territories into the Canadian federation. The British North America (BNA) Act, 1867 merged three British colonies — the Province of Canada (present-day Ontario and Québec), Nova Scotia and New Brunswick — into a new federation called Canada, with its capital in Ottawa. 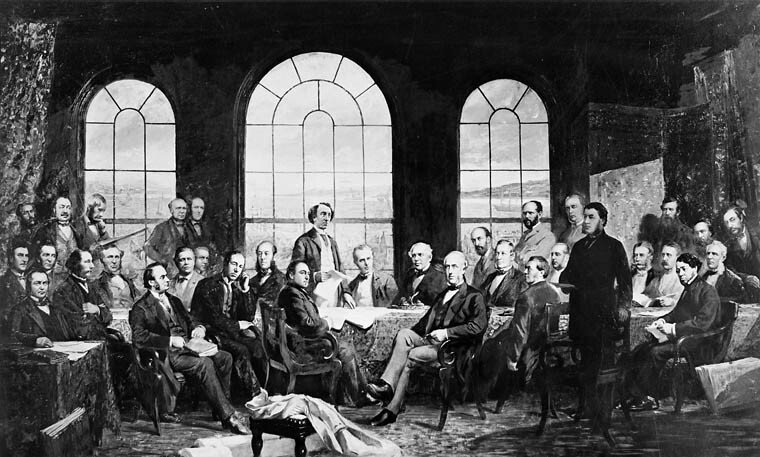 The British parliament passed the law at the request of the colonies, whose leaders met and agreed to its terms at the 1864 conferences in Charlottetown and Québec City. The Conference at Québec in 1864, to settle the basics of a union of the British North American Provinces. The BNA Act created four provinces (Ontario, Québec, Nova Scotia and New Brunswick) and provided for the admission of others. Power was divided between the federal Parliament and the provincial legislatures, with the courts acting as arbiters in cases of disputed jurisdiction. The federal Parliament was assigned responsibility for citizenship, Indigenous peoples, national defence, criminal law, penitentiaries, marriage and divorce, interprovincial and international trade, bankruptcy, banking, money (including currency and coinage), the postal service, shipping, fisheries, the census and statistics, weights and measures, patents, and copyrights. The provincial legislatures were given power over municipalities, hospitals, schools, prisons, property, and provincial courts. There is joint federal-provincial responsibility over agriculture and immigration. Later amendments gave the federal Parliament authority to create an unemployment insurance system (1940) and clarified provincial jurisdiction over natural resources (1982). Court rulings have recognized that federal authority includes several trans-provincial matters that had not existed in 1867, such as aviation, pipelines and telecommunications. The authors of the BNA Act had intended for the national government in Ottawa to be more powerful than the provincial governments. Yet over time, the provinces grew in power. In part this was because of the growing importance of areas of provincial jurisdiction (such as social programs and natural resources) and in part because of a series of court rulings that favoured the provinces. The federal Parliament is composed of the monarch and two houses: the Senate and the House of Commons. There are now 105 members of the Senate: 24 each for Ontario, Québec, the Maritimes (10 for Nova Scotia, 10 for New Brunswick, and 4 for Prince Edward Island), and the West (six each for British Columbia, Alberta, Saskatchewan and Manitoba); six for Newfoundland and Labrador; and one each for Yukon, the Northwest Territories and Nunavut. The Parliament buildings in Ottawa, seat of the federal government. Senators are chosen by the prime minister, officially appointed by the governor general, and hold office until age 75 (until 1965, senators were appointed for life). Members of the House of Commons are elected by popular vote, with a general election held at least once every five years. 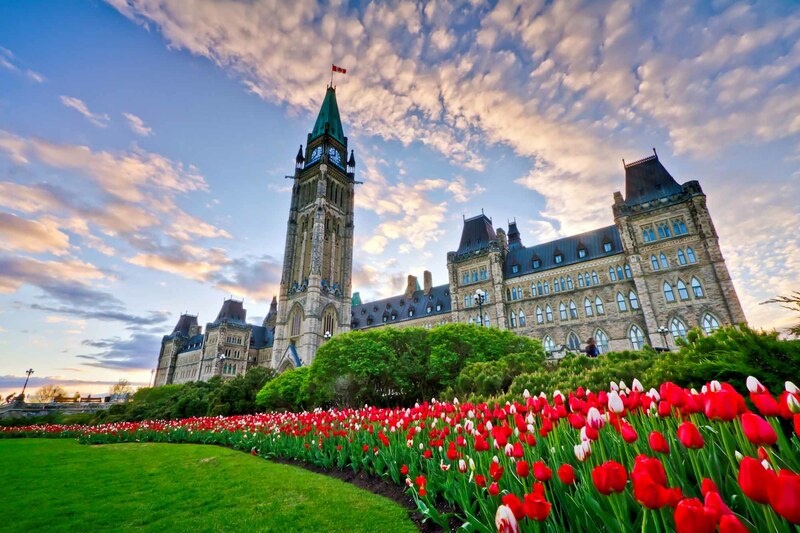 Each province and territory is allotted seats in the House of Commons based roughly on the province’s population, with the proviso that each province is entitled to at least as many members of Parliament (MPs) as it has senators. New bills must pass each house of Parliament and gain royal assent (from the governor general) before becoming law. Executive power is vested in the monarch, but is exercised at the federal level by the governor general, whose power is strictly limited by both constitutional convention and statute law. In practice, this means that the executive is headed by a prime minister and cabinet, who are accountable to Parliament for the affairs of government. 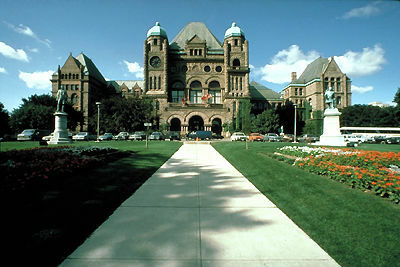 Ontario legislative buildings, Toronto, seat of the Ontario provincial government. Each province has a legislature composed of a lieutenant governor and a single legislative house, elected at least once every five years. Québec, Nova Scotia, New Brunswick, Prince Edward Island and Manitoba had legislatures with two houses when they joined Confederation, but they all subsequently abolished the upper house. Executive authority is exercised in the same manner as at the federal level, with the lieutenant governor representing the monarch, and the premier leading the government. Also part of the written Constitution are the acts and orders to admit new provinces and territories. These include the Manitoba Act, 1870; the Rupert’s Land and North-Western Territory Order (1870); the British Columbia Terms of Union (1871); the Prince Edward Island Terms of Union (1873); the Adjacent Territories Order (1880); the Canada (Ontario Boundary) Act, 1889; the Alberta Act (1905); the Saskatchewan Act (1905); the Newfoundland Act (1949) and the Constitution Act, 1999 (Nunavut). The first page of the Statute of Westminster (1931). An Act of the British parliament, the Statute of Westminster, 1931 was the all-but-final achievement of legislative independence from Britain. 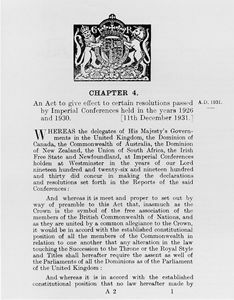 Under the statute, British law would no longer apply to Canada, except where Canadians asked the British parliament to continue to legislate (appeals of Supreme Court of Canada decisions to the Judicial Committee of the Privy Council in Britain continued until 1949, when Canada chose to end this practice). Canada’s federal and provincial governments could not agree on how they would pass future amendments to the British North America Act, 1867. As a result, the British parliament was asked to retain the power to amend Canada’s Constitution until Canadians could come up with their own formula for doing so. The Constitution Act, 1982 completed the unfinished business of Canadian independence. The law was enacted by the British parliament following months of political negotiation in Canada between the federal and provincial governments about how to "patriate" the country's last British-held powers from London. The resulting Constitution Act, 1982 made several changes to Canada’s constitutional structure, the two most important being the creation of an amending formula, and the entrenchment in the Constitution of the Canadian Charter of Rights and Freedoms. Under the amending formula, most sections of the Constitution can be changed upon approval from the Senate, the House of Commons, and the legislatures of at least two-thirds of the provinces, so long as those provinces contain 50 per cent or more of the population of all the provinces. Unanimous agreement of the Senate, the House of Commons and all ten provincial legislatures is required to abolish the Senate, or to amend constitutional provisions that deal with the composition of the Supreme Court of Canada, the use of the French and English languages, the right of a province to have at least as many members of Parliament as senators, or the offices of the monarch, the governor general, or the lieutenant governors. Amendments that deal with some but not all of the provinces (for example, changing the boundary between two provinces) may be made by the Senate, the House of Commons, and the relevant provinces. A constitutional amendment can proceed without Senate approval if the House of Commons approves the amendment and then does so again at least 180 days later. 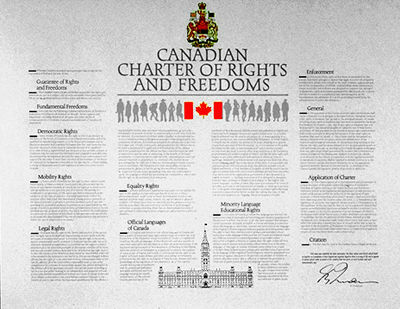 The Charter of Rights and Freedoms guarantees, and sets out limits to, the fundamental rights and freedoms of Canadians. Under the notwithstanding clause, the federal Parliament or the provincial legislatures can exempt any law from certain Charter provisions for up to five years. The Constitution Act, 1982 also reaffirms the existing rights of the Indigenous peoples of Canada, though these are left largely undefined. In addition, the Charter of Rights and Freedoms guarantees Indigenous peoples their rights under the Royal Proclamation of 1763, which specified that they would continue to hold all lands they had not ceded or sold. Constitutional conventions are the unwritten rules of the Canadian system of government, filling the holes in the written Constitution. For instance, none of Canada’s constitutional documents defines the method of selecting the first ministers (the prime minister and the premiers) or the cabinets. This is governed by convention. Conventions are in the political realm and are not enforced by the courts, though courts have given opinions on the existence and application of conventions. It is up to voters to enforce conventions at the ballot box. The British North America Act gives extensive powers in theory to the governor general and the provincial lieutenant governors. Conventions strictly limit their personal discretion in the exercise of these powers in all but the most exceptional of cases. Governors general and lieutenant governors act only on the advice of ministers and must follow that advice, so long as the government maintains the confidence of the legislature or Parliament, and the advice is constitutional. When the office of first minister becomes vacant, the governor general or lieutenant governor invites an individual who can command the confidence of the legislature to become first minister and form a cabinet. In practice, this is almost always the leader of the party with the most seats. If no party can command the confidence of the legislature and form a government, an election is called. These conventions ensure that the government is accountable to the legislature and, by extension, the electorate. According to the confidence convention, when a majority of the members of a legislature no longer have confidence in the government (and express their lack of confidence in a vote in the legislature), the first minister must resign or ask for an election to be called. The Canadian Constitution is a complex mix of statutes, orders and unwritten rules, created over time. The Constitution has been successful in adapting to changing circumstances, and in providing Canada with the legal framework for a stable, democratic government. 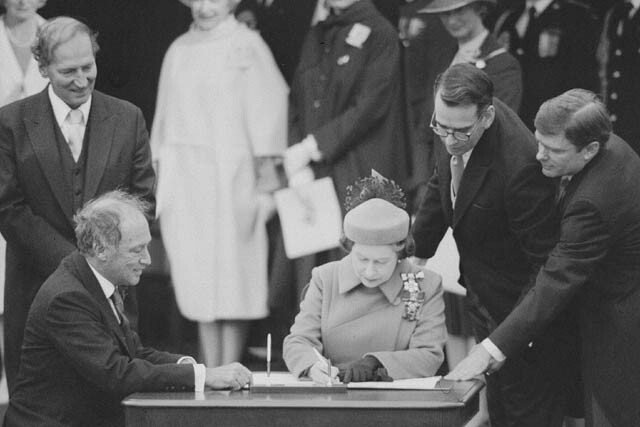 Queen Elizabeth II with Prime Minister Pierre Elliott Trudeau, signing the patriated Constitution, on 17 April 1982. Eugene A. Forsey, How Canadians Govern Themselves (1980); G.-A. Beaudoin, La Constitution du Canada (1990); Andrew Heard, Canadian Constitutional Conventions: The Marriage of Law and Politics (1991); Peter W. Hogg, Constitutional Law of Canada, 5th ed. (2011); Adam Dodek, The Canadian Constitution, 2nd ed. (2016).